Being a sponsor of the Australian E-Sports League’s (AEL) University Cup in its inaugural year, D-Link this month was invited to participate at the Intel Extreme Masters (IEM) event held at Qudos Bank Arena at Sydney Olympic Park, and I made some time to make sure I got along. Apart from being close to the oldest person in the venue, participating in this event opened my eyes even more to the E-Sports fraternity, and where it is heading. Whilst I’ve always considered myself a bit of a gamer, from the early games such as Doom and Quake, to strategy games such as Total Annihilation, Command & Conquer and its ilk, and now to Xbox games such as Rocket League and the FIFA football franchise, I was really interested to see what the latest and greatest games, and the people that play them, were like. E-Sports in Australia, according to the AEL, has a larger fan base than either Netball or Swimming, and they explain that more than 27 countries now recognise E-Sport’s as an official sport. I was also surprised to hear that for one game alone, DOTA 2, the total prize pool at the 2017 DOTA 2 International event held in Seattle in the US was over USD$24M and in the same year, 73M viewers watched the League of Legends World Championship. No matter which language you speak, these are big numbers. We saw many gamers come along to our stand at the event to try out their skills in taking out the fastest lap time of the day on our dual racing simulators running iRacing and RFactor, some old school, but with very realistic physics, racing simulation software, and the lines were 10- deep at some stages across the weekend. Being a local business, of course we had to have a V8 Supercar set up to run on Bathurst’s Mount Panorama circuit, and the rivalries of some of the drivers who had a shot at glory was intense. PC&TA’s very own Ben Mansill, who, despite a nasty bump on the way down through Skyline and having his bonnet clouding half his screen for most of his lap, still managed a very respectable 2:15 minutes for his flying lap. 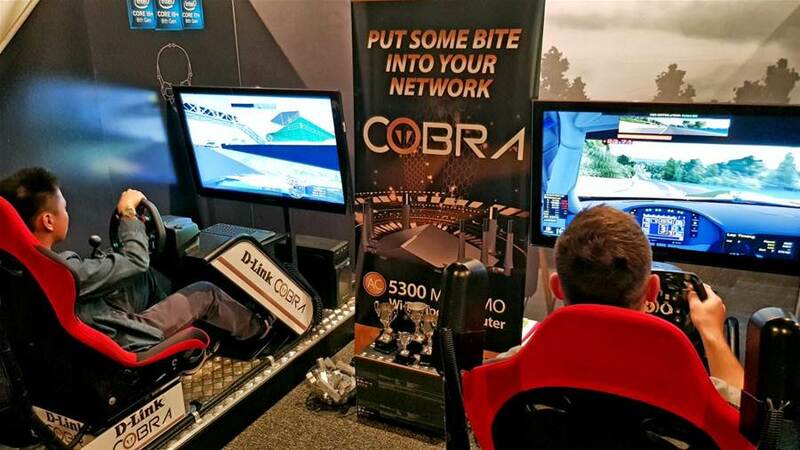 Much kudos though goes to our overall lap time winner across the event, Edward V, who came in with a 2:07 min lap and took home a Cobra AC5300 Modem Router as a result. So of course, later that day I get home and fire up the PC and Steam, with my all-time favourite first-person shooter, Modern Warfare 2. I found myself putting off things that I should have been doing all weekend, like tidying up the garage and fixing kids bikes, and instead find myself with a can of coke, headset firmly plastered to my head, and camped out with a couple of 18+ year old kids on a LAN session with The Estate map, and battling juggernauts to give ourselves enough firing space to pull out the trusty Intervention to take it down. Oh the memories came flooding back, but certainly the old snap twitch has lost its flair, now I prefer grenade launchers, and I get laughed at online as a result (probably just because the young kids can’t handle being taken out by the old man!). The result of these past weeks IEM since has been the reflection that what was once a pastime has now become a mega industry in its own right, but also that my gaming life is somewhat reinvigorated, and I can’t wait to see the line up at the AEL University Cup Grand Final on June 2nd at Sydney Uni, and to see who takes out the trophy (and if anyone can beat my new lap time on the racing simulators). Until then, good gaming. Ask Graeme about networking, the internet, getting the most from your gear and this wonderful digital world we live in. Each month we’ll choose one for Graeme to answer here.